Only a few years ago, few had ever heard of "Francesinha". And that was OK, there was no need to have ever bothered. Now all this has changed and people in and around Porto pride themselves with a new street food delicacy immigrants have brought back to the north of Portugal. 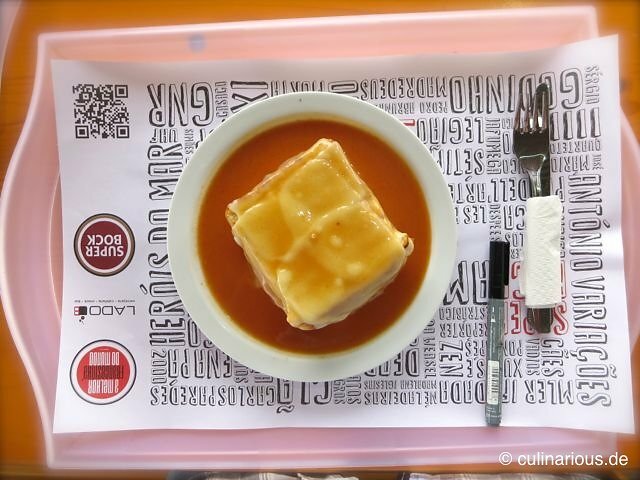 "Ha Francesinha", that's what you find in any snack bar, or worse, even restaurants in this fascinating city. Now, some say that Portugal is not a culinary heaven despite its already twelve Michelin starred restaurants (with mostly chefs from other countries in charge). And even so Portwine has long been rejected as an old people's favourite, mostly appealing (historically and today) to UK citizens, it has to be said that neither Portuguese cooking is necessarily uninteresting nor is Portwine particularly wrong. In fact, Portugal's wines are among the finest in the world with varieties unheard of in other parts of the world. It is more due to the limited volumes produced every year that only few wines, usually the not-so-good choices, make it to other parts of the world. The Portugese tend to keep the good ones for themselves - clever move, I have to admit! Portugese cooking often has a rustic charm but can be fairly solid and tasty. It is, yet again, typical that the great cooking cannot be found in the larger cities but rather in the countryside. And those who have ever tasted the incomparable Barroso beef will find it hard to go back to the beef we find on the shelves at home or in restaurants. Having said all this, it is difficult to understand that a fully loaded "Tostas Mistas" is turned into a soggy something by pouring a "secret sauce" based on beer and tomatoes over it, drowning anything that might have been tasty a few seconds before. 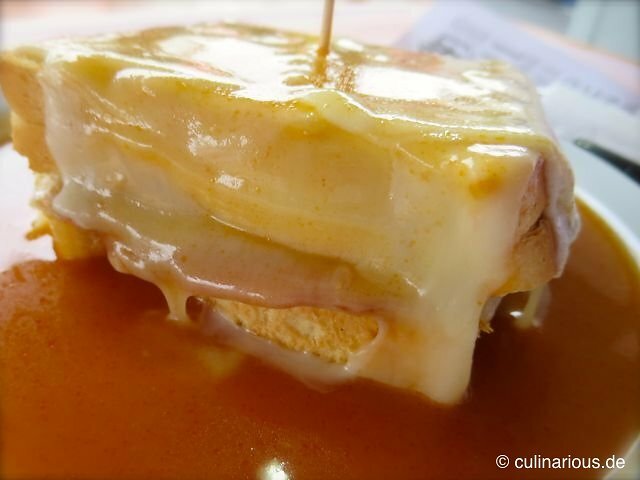 All the layers of meat and cheese inside a "Francesinha" are challenging enough for anyone, but the dripping sauce takes out all the beauty and simplicity of a "Tostas Mistas" with its classic queijo and fiambre, the ever present food choices in Portugal. But "Francesinhas" are a popular choice by locals as much as tourists. Admittedly, every region has one (or more) of these crazy local dishes you cannot fully appreciate if not genetically prepared ready to do so. Why would anyone add vinegar to crisps? Deep frying a boiled egg with sausage like in a Scotch Egg? Have I mentioned Haggis? Alas, the "Francesinha" is no less obscure than many other "classics from other parts of the world.